An ATF raid, a moonshot gone wrong, a busload of female cancer victims determined to live life to the fullest—these are the compelling terrains Adam Johnson explores in his electrifying debut collection. 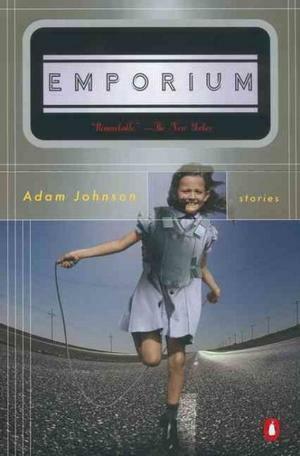 A lovesick teenage Cajun girl, a gay Canadian astrophysicist, a teenage sniper on the LAPD payroll, a post-apocalyptic bulletproof-vest salesman—each seeks connection andAn ATF raid, a moonshot gone wrong, a busload of female cancer victims determined to live life to the fullest—these are the compelling terrains Adam Johnson explores in his electrifying debut collection. A lovesick teenage Cajun girl, a gay Canadian astrophysicist, a teenage sniper on the LAPD payroll, a post-apocalyptic bulletproof-vest salesman—each seeks connection and meaning in landscapes made uncertain by the voids that parents and lovers should fill. With imaginative grace and verbal acuity, Johnson is satirical without being cold, clever without being cloying, and heartbreaking without being sentimental. He shreds the veneer of our media-saturated, self-help society, revealing the lonely isolation that binds us all together. This book struck me as a bad impression of the contemporary Ironic Male Short Story Writer. Even the diction seemed loosely formed and without a certain urgency I look for in short stories. This is the second time I've read this collection, and it was well worth rereading. From the touching to the bizarre to the comedic, Johnson has a a great imagination and a wonderful gift for words. For me 'The Canadanaut' a funny, quirky tale about a group of Canadian scientists working on death rays and moon launchings was the highlight, but every story was worth reading. Highly recommended. Varied locations, narrators, characters, but always with a serene balance of dread and hope? The stories are engaging and leave you both wanting more and content with the snapshot into the lives Johnson lays bare. Oddities and sci-fi aspects only lend to the weird and enjoyable tone. Never been disappointed with Johnson. I found this collection slow and self-regarding. Other people might love them, but the stories seemed inconclusive and a bit pointless. Perhaps that is indicative of the lives of the characters/society, but it seemed like classic MFA in creative writing style and the twists felt gimmicky. So I read this one for a college course. Not bad, not bad at all. I think all of the stories were very creative and very witty. Though my favorite had to be the first; Teenage Sniper. But all of them were very interesting. I enjoyed how Johnson expirmented with different points of view (1st, 2nd, & 3rd person) and I enjoyed how he took such out there topics like creating a death ray and made it seem so normal. Johnson is a very skilled writer, but these stories are pretty opaque. I loved The Orphan Master's Son, but I think Johnson was still figuring out with this earlier work how to be subtle effectively. In Orphan Master's, he's mastered how to be subtle and clear at the same time.This book has probably four excellent stories in it, which is pretty average for collections. The ones that are good here, though, are really, really good. "The Canadanaut" was such an amazing story that it alone makes this collection worth reading. I wasn't as keen on the rest of them, but certainly the stories display deeply researched subjects and careful thought. Most are plotless however, so you have to be ok with the idea of plotless stories. Writing style reminded me quite a bit of Wells Towers. Johnson is quite a talented young writer, mining the vein between Kurt Vonnegut and a juvenile version of Raymond Carver. His use of metaphor verges on magical realism at times and distracts from the morality plays at hand--which also evoke Palahniuk--but this is a small quibble in a collection that is mostly very satisfying. Disappointing short story collection by the author of Orphan Master's Son, which I thought was a fantastic book. I am still looking forward to reading his newer story collection Fortune Smiles, which just won the National Book Award, as I heard him read from it at the Wisconsin Book Fest, but none of the stories in this older collection of futuristic stories appealed to me. A bit too madcap for it's own good sometimes - certainly falls prey to the modern obsession with idiosyncratic detail (teenage sniper, Canadian Scientists working on a Death Ray, etc.) but at it's best it transcends all it's overly whacked out details. The endings are especially good. Adam Johnson writes amazing, weird, intense, disturbing characters. These short stories are almost too much. I really look forward to his next novel since I loved The Orphan Master's Son. An eclectic collection of stories that are as clever as they are affecting. Johnson seems like a talent to watch.